Fine Gold is a new Timing specially written for use with Monoloop coils. It runs quietly in most heavily mineralized ground & вЂ?hot rockвЂ™ ground. It is not as quiet as Enhance but it has noticeably more depth and is ultra-sensitive to small sub-gram nuggets. This Timing will be a real winner! Salt / Gold is again a new Timing, suitable for both Double-D and Monoloop coils. While this Timing is fabulous on mineralised salt flats, it also works quite well on some highly mineralised patches. The big difference youвЂ™ll find between this timing and the Salt-Coarse Timing found on the GPX 4800 & GPX-4500 is that Salt / Gold has a lot more sensitivity to small targets. Using Salt / Gold timing compared to the standard Salt-Coarse will give just as much depth, but improved small gold recovery. This timing also works great on wet sand at the beach. Coin / Relic is specially written for absolute neutral, benign soils. It gives increased depth in this neutral environment and will be good for relic or treasure hunters who are looking for maximum depth away from the mineralized grounds. The Enhance Timing on the GPX 5000 and 4800 is slightly improved from the 4500. Using feedback gathered from GPX-4500 users, the Enhance timing has been tweaked, to provide more positive target signals in mineralized ground. A lot of development and field testing has gone into the circuit board of the new GPX 5000 and 4800 to increase target sensitivity, and improve ground balance performance. Always remember: A Stable Detector Finds more Gold. The Rx gain adjustment has been increased from 15 to 20 calibrations. On the GPX-4500, you may have found that a setting of 12 gave too much chatter, but 11 was too quiet. Now with the extra calibrations you have an expanded range that improves your fine tuning ability. 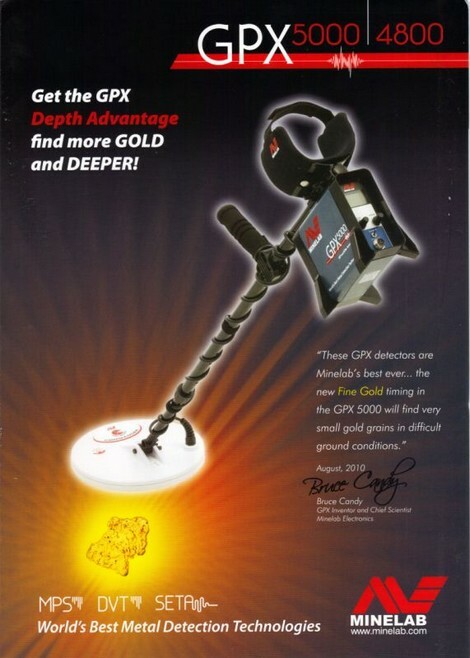 The GPX 5000 is loaded with 6 factory Search Modes to make it easy for all operators to just switch-on and go detecting. These Search Modes are to suit most common detecting scenarios, but a customer can then adapt them to suit their own preferences and detecting location. Supplied as standard with each GPX 5000 is the very popular 11вЂќ Monoloop coil as well as the standard 11вЂќ Double-D coil. Multi Period Sensing transmits, receives and analyses a stream of long and short pulses to SENSE GOLD whilst ignoring ground minerals. Dual Voltage technology uses pulses with 2 voltage levels to put MORE POWER into the ground, enabling deeper detection. Smart Electronic Timing Alignment uses mathematically precise Soil/Timing alignment for MAXIMUM DEPTH and sensitivity across ALL ground conditions.